The S39 Barsystem is a super automatic new-generation machine that is exceptionally easy and versatile to use, for an in-the-cup quality in line with the Cimbali tradition. MilkPS (Milk Precision System) – equipped with the Cappuccino System with the MilkPS and a standard steam wand. 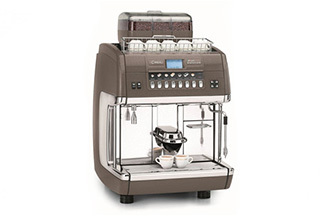 User friendly superautomatic espresso and cappuccino machine. Equipped with the ThermoDrive, an easily adjustable group thermal balancing system. Cappuccino System for one-step cappuccino and latté, equipped with the exclusive Milk Precision System (MilkPS), thanks to which you can: obtain a consistent in-the cup milk dose; customize milk temperature for each selection (patent pending); prepare stratified beverages; place the fridge under the counter; assure ideal hygiene conditions by automatically emptying the milk circuit at the end of each delivery cycle.